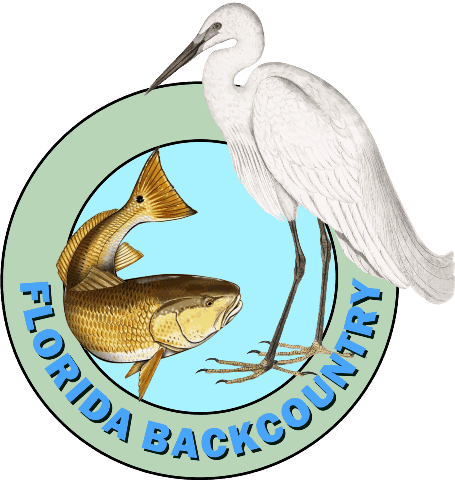 Since we are in the business of providing simple solutions to common problems while flats fishing, we at Florida Backcountry came up with another use of the PoleMate's patented design. Its development brings about a story that I would like to share where the concept and application of the Towemate™ came about. A kid with a love of fishing, living in Chicago land and moving to a saltwater fishing paradise sets the stage. 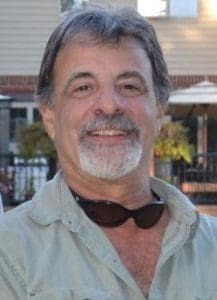 My cousin Dave is the one who is responsible for my love of fishing He turned me on to it when I was sixteen years old at a place called Angies Cast and Catch, a pay pond outside of the south suburbs of Chicago. I went to pick him up to go out that evening at the pond where he had been most of the day. When I arrived he had a spinning rod with a bobber on the line he had cast out and down it went. He handed me his outfit so I could reel it in and I was gut hooked immediately. As we grew older we planned fishing trips through the winter we planned on taking. When spring would break, first stop was the white bass run in Fremont Wisconsin. Great memories and lots of fun fishing with my buddies. Next stop would be a smallmouth bass and northern pike Canadian fishing trip in Ontario. A long drive but worth every minute of it. More great memories. After these annual fishing tips, we would pursue bass fishing in the Kankakee River in Illinois. A short drive from where I resided and though the fishing was less than spectacular the memories I made while fishing that river remains dear to me. I remember one year we decided to go in the opposite direction of Canada and hit the Florida Keys to try our hand at some saltwater fishing. Wow, what a beautiful and exceptional place. We were young with not much money so we would fish off the bridges, not the bridges of today, but the bridges of the past that were so narrow you would cringe when an oncoming semi was coming right at you. The old bridges had a short stairway that led you to a fishing area beneath them. We would send out live small fish we would catch, bait them up on our bait casting rods, and catch large barracudas that ran and skyrocketed when hooked, jumped tarpon and caught all different species of fish we could not identify and had to look up in a book. Not having any saltwater tackle it was surprising we were able to catch anything. What thrills, that was fishing like we never experienced. Living in the Chicago area and loving to fish always presented a huge problem. I lived right on the border of corn and concrete, and having the love of fishing and being able to fish was a problem in itself, let alone trying to “scratch that itch” to fish when it is 5 above zero. During the long winter months I would grease and oil my spinning reels and baitcasting reels, check the guides on my spinning rods and bait casting rods and, spool fresh line on my outfits, and dream of the upcoming spring. When I couldn’t stand it any longer and have a bad case of cabin fever, I would venture out to the power plant on Lake Michigan and try to fish in weather where the guides would ice up and shiver like crazy. I could never get warm, no matter how much goose down I would wear. I did not finally make the move to Florida until I was thirty years old. It was a BIG deal for me to leave all my friends and family, but the pull of the dream to be able to fish the beautiful waters in Florida all year long was overwhelming and I finally had the chance in life to do it and off I ventured. It took a while to settle in and the exploring of all the angling opportunities was challenging and exciting. I had an old friend who moved to Central Florida and settled in Debary after living here for seven years. With that knowledge, I also settled in Debary. I figured my buddy was living in the area here long enough to find a nice area to settle and I would have an old friend nearby. Well, he found a great spot and I could not be happier with his selection. The St. Johns River is right in my backyard and the Merritt Island National wildlife refuge is about a 40-minute drive. Fishing paradise for a guy from the suburbs of Chicago. After moving to Florida I would plan trips to the keys annually. Back in the mid to late eighties I would visit and fish the Florida Keys at a minimum of 3 times a year. It was on one of those trips that the idea for the TowerMate was conceived. I was already working on prototypes for the PoleMate. I still did not have the design firmly thought out. One day in the fall of the year, my buddy suggested it was time for a fly fishing bonefish trip to the Keys. I would usually plan my Keys excursions around tarpon fishing season but my buddy wanted to go bonefishing this particular trip so off we went. We decided to fish out of Pennekamp Coral Reef State Park in Key Largo. The first day we ventured out on the Atlantic side and headed a little north and settled on a nice looking flat on an incoming tide. I throttled down the skiff and climbed atop the poling tower with a push-pole in hand with my fishing partner headed to the bow casting deck with a fly rod and fly reel in hand. At that time I had purchased a push pole holder that attached to the top of my poling tower. I began poling this beautiful area totally mesmerized. As time marched on we started to see stingrays and bait fish, always a good sign. All the ingredients were assembling for a successful day when I noticed the wind was picking up. Not a surprising situation, especially on the Atlantic side. We continued across the flat spotting some bonefish and my buddy had quite a few opportunities but never getting hooked up. As the wind increased I no longer had the easy poling that I had earlier and had to start really putting some effort in on my push poling. The flat we were fishing had some hard coral outcroppings and I felt the push pole slip every now then. We finally saw some fish that were stationary and I was trying my best to maneuver the skiff for my buddy to get off a cast and really began leaning into the push pole to maintain the boat's position when it slipped on the rocky bottom. I did my best to keep my balance and just about recovered as I re-planted my feet, only to trip on that darn push pole holder mounted on top of my poling platform and off the back I fell. I knew I was going to fall so I pushed off the back the best I could so I would not land on the prop and skeg of my outboard. That could have been brutal and most likely would have been the end of that trip for sure. Luckily I was not hurt except for my pride. This all happened on a poling tower that was large compared to today’s poling platforms and I wondered why anyone should increase the risk of a fall by mounting anything on top of a poling platform. So this incident laid the groundwork for the TowerMate with its design to mount on the side, not the top, of a poling tower platform. As time rolled on I finally decided on the final design of the PoleMate and applied for my patent. After having the first few fabricated I noticed how I could use the clip half of the PoleMate, and by using just one small screw, attach it to the side of a poling platform skirt. I also knew that since it was made of ABS plastic that it would drastically reduce the chance of producing any noise when the push pole holder would be engaged. I went right out and mounted two of them, one on each side of my poling platform and went out to test them out. 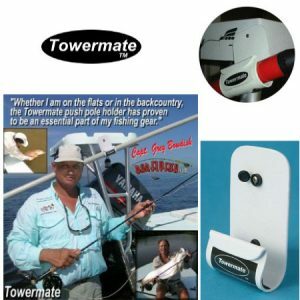 It worked beautifully and really did a nice job of acting as a push pole holder while eliminating the problem of protruding obstacles on the top of any poling platform and hence....... the TowerMate “Shorty” was born and launched as another tool to help the flats fishing community.